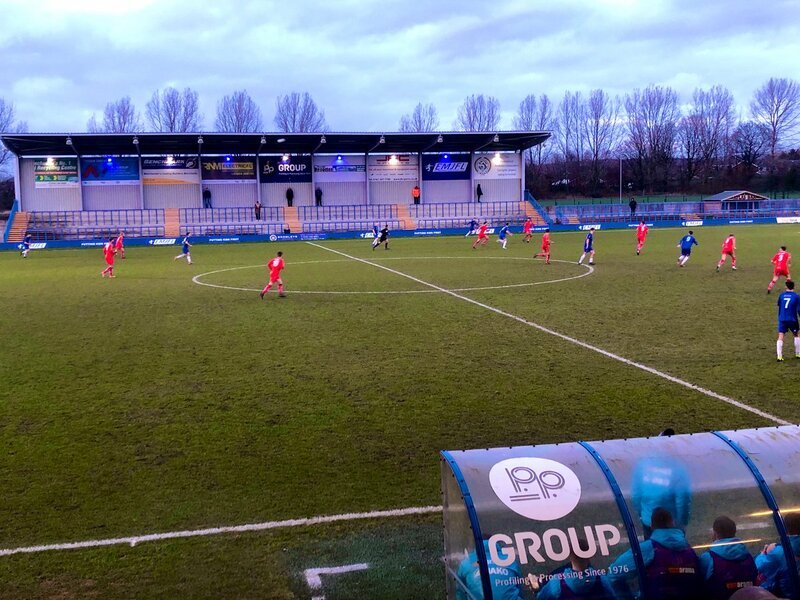 Ten man Alfreton Town surrendered a two goal cushion to lose 3-2 in a quite incredible game at the Tameside Stadium on Saturday afternoon, which saw a 24 minute first half delay and three second half goals for the hosts. Billy Heath named an unchanged side from the one that lost to York the previous Saturday, Curtis Bateson and Tom Allan made the bench. The hosts started the game well with early advancements into our half but both sides were struggling to get a grip on the ball with possession being traded throughout the early minutes. Luke Shiels cleared an early floated free kick before we created the first major chance which gave us the lead. With seven gone, a cross from the left from Josh Wilde was chested down by Reece Styche at the far post and he blasted the effort into the far corner to give the Reds the perfect start. The goal saw us dominate the immediate proceedings, a wonderful ball from Josh Clackstone nearly found Danny Clarke at the far post but good defending cleared the ball behind. The resulting corner from Bobby Johnson nearly found Styche at the far post but there was just too much on it. Styche was then caught narrowly offisde from Johnson's through ball, a call which looked extremly tight from our position. Moments later Styche was caught offside again, much to his frustration and on 18 minutes the Reds striker was sent off with a straight red card following what looked like a heated discussion with the Referee. This was yet another body blow in a contest for the Reds this season, a familiar feeling for Alfreton in games when the Reds are firmly in control. Shiels headed a good corner chance over the bar before Clarke couldn't quite get a shot off from Clackstone's cross on the left. Then with 27 minutes played, the linesman pulled up with what looked like a calf injury. The game was stopped whilst a replacement was sourced, Reds kit lady Pam Leaning was a qualified official and volunteered to run the line but the request was initially rejected by Curzon. With the game close to an abandonment, Curzon then agreed to Pam running the line; a mere 13 minutes after the initial offer. The game restarted after a 24 minute delay with Pam running the line on the far side. After the restart, the ten men Reds incredibly doubled the lead on 33 minutes when Wilde was put through in the box and he lifted the ball over Mason and into the net to extend our cushion. The Nash looked to react and Clackstone, Shiels and Martin Riley all cleared balls in, McJannet then fired way over the bar from the edge of the box. Dom Smith should have made it three but his header went inches wide of the far post from a corner before Sam Ramsbottom was called into action for the first time, palming a cross from the left which took a deflection and was looping over him. Half time arrived at 4.15pm and the Reds looked to secure the lead in what was a brilliant first half in the context of the game. However the second half started in the worst possible manner with a different Alfreton greeting the second half. 47 minutes gone, Curzon pulled one back when Reilly tapped in Wall's cross from the right, then two minutes later it was 2-2; Crankshaw's cross from the left caused problems and was missed by the Nash forward and it hit Riley and squirmed into the bottom corner. It was an implosion for the second game in a row after blowing a 2-1 lead against York, we looked to fight back with several corners earned but the whistle went for a foul on Mason in the box as Shiels rose. Crankshaw curled an effort over the bar following a short corner before Riley had a huge chance from a Johnson corner, Riley timed his jump expertly but the header went inches wide again. Clackstone was the Reds main source of pace but too often we had one or two players in the opposition half and our attacks fizzled out due to a lack of options. Clackstone made several great runs in behind but these were tracked well and cleared. Crankshaw fired wide from distance but on 82 minutes the hosts completed the comeback when McAtee powered a header from a left wing cross past Ramsbottom to sink the Reds yet again from a winning position. It could have been worse for Alfreton on 85 minutes when Crankshaw was tripped in the box by Ramsbottom following a counter attack but Sam stood firm as the Curzon winger dusted himself off, diving to his right to save the penalty. However the Reds couldn't create another chance and will be once again bitterly disappointed to lose the contest from a two goal lead. It was an incredible game which had it all and our thanks and love go to Pam who ran the line and ensured the game continued. The Reds will be desperate to get points on the board after another defeat which saw us lose a dominant position. Next up we head to Matlock Town on Tuesday night for a Derbyshire Senior Cup semi final, kick off is 7.45pm. We then face league leaders Chorley on Saturday at the Impact, kick off is 3pm. ATFCXI: Ramsbottom, Clackstone (O'Brien 83), Wilde, Lynch (Sinnott 87), Shiels (c), Riley, Styche, Platt, Clarke (Allan 73), Johnson, Smith. Subs Not Used: Bateson, Hotte.